If one million players download the Dragon Age II demo in the week following its February 22 release on the Xbox 360, PC, and PlayStation 3, magic artifacts will be theirs for the taking. 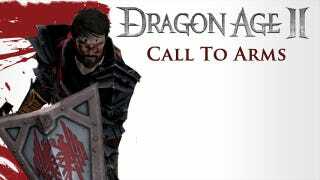 BioWare issues its Dragon Age II Call to Arms. A million downloads may seem like quite a lot, but when you're spreading things across three platforms it isn't really that daunting of a number. I'm guessing BioWare will hit the one million mark within the first two days, and that's without even taking the two special Dragon Age II items being unlocked in the full release into account. Players need only log into their EA account while playing to have their download counted. Once the one million download mark is hit (as tracked on the official webpage), the entire community will get their hands on two special books when the game launches on March 8: The Far Cliffs of Kirkwall, an ancient book that gives money when read; and Lothering's Lament, a similar tome that doles out experience points. How fast do you think the demo will hit one million downloads?